Voice of the Future 2019: environmental policy beyond Brexit? 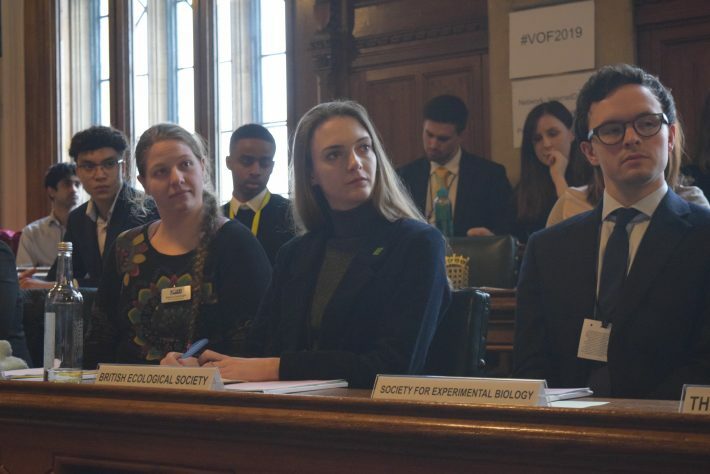 On 12th March, three British Ecological Society members were delighted to participate in Voice of the Future (VOF) 2019. VOF is an annual event hosted by the Royal Society of Biology at the Houses of Parliament. 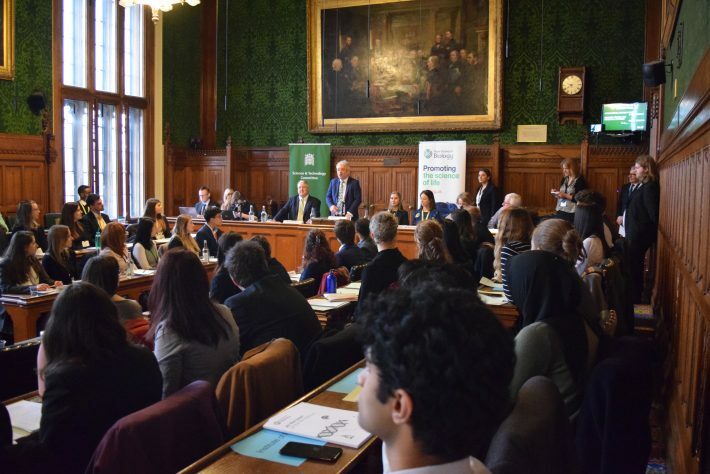 It offers young scientists and engineers the opportunity to question MPs on their thoughts and plans for the future of science in the UK. The event opened with the Speaker of the House, Rt Hon John Bercow MP, talking about the importance of science and opening on his own challenges with the subject at school, which he put down to poor teaching! He also welcomed the increasing number of people with scientific, mathematical, and engineering backgrounds entering Parliament. The morning was divided into four sessions during which attendees were able to question a different panel. The first session comprised MPs on the Science and Technology Committee; the second session was the Government’s Chief Scientific Advisor, Sir Patrick Vallance; the third session saw Chris Skidmore MP, Minister of State for Universities, Science, Research and Innovation take the hot-seat; and in the fourth session it was the Shadow Minister for Industrial Strategy, Science and Innovation, Chi Onwurah MP. Below are the reflections of three BES members who took part in the event. Katherine Mullin, PhD Student, asking a question on behalf of the BES. 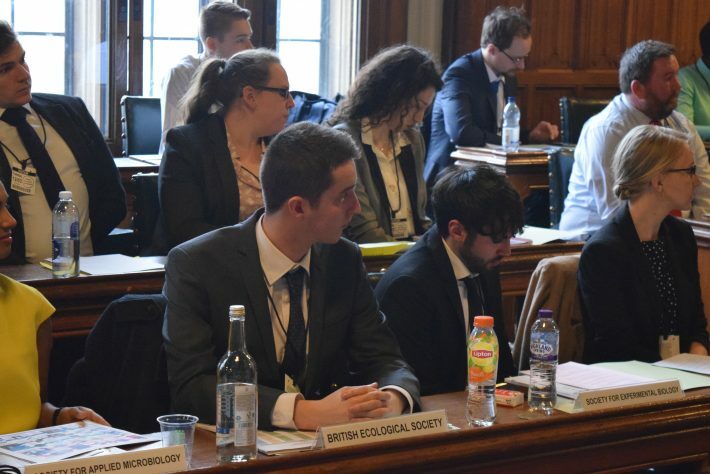 I had the fantastic opportunity to represent the British Ecology Society on behalf of young scientists at VOF. I saw this event advertised through BES’s e-Bulletin and was interested as soon as I read about it. It came as no surprise that Brexit was mentioned more than once, perhaps ironically, considering this event was held on the day of one of the key March votes! But questions varied from funding and collaboration woes, post-Brexit, to how to address fake news in science. The Minister said that he is keen to use technology being developed to favour ecological / environmental research. For example, using AI to develop carbon capture research to help achieve the government’s ambitious target of planting 180,000 hectares of woodland by 2042. However, he acknowledged that protecting our environment isn’t all about technology and welcomed ideas about how our government can invest money in order to achieve this. I felt encouraged that those speaking identified a need for even more Parliamentarians with a scientific background, , especially those with ecological backgrounds! If becoming a politician is not for you, their advice for engaging with politics was to use your voice persistently and perseveringly, getting your message(s) out to your local politician. This event opened my eyes to the importance and use of science in our government and its policy. I strongly encourage other young scientists to take part in events like this in the future. I had the exciting opportunity to take part in VOF and represent the British Ecological Society. Taking a seat in Committee Room 14 in Parliament as someone interested in the science-policy interface was an exhilarating experience. Surrounding me were not only decades of political history, but early career research representatives from over 20 scientific institutions. Talking with fellow delegates was truly humbling, not only in the breadth of their personal experience but the diversity of themselves and their institutions. In the weeks prior to this event, demonstrations had been conducted by school children protesting about the ongoing threats of global climate change and anthropogenic extinction. Resultingly, questions were asked about not only current political issues, but emerging ones. The panellists were united in praising the efforts made by young people to evoke change and safeguard their futures. They made it clear that government needs scientists now more than ever. Britain is a world leader in science and moving forward scientific knowledge will be more important than it ever has been. The panellists acknowledged that although progress has been made with issues like air pollution, more progress can be made, so we should not congratulate ourselves just yet. They also suggested that while scientists do excellent research, there are opportunities to improve science communication. In an age of misinformation, we must be responsible for disseminating not only the truth, but a way of thinking that stops information being accepted at face value. I was due to ask about whether the UK would continue to use mechanisms such as the precautionary principle as extensively as required by EU law post-Brexit, but unfortunately time constraints forced my question to be skipped. The other Brexit related replies suggested that there is a sincere and genuine commitment within government to not only maintain environmental standards in the event of Brexit, but to enhance them. Overall the day was a fantastic experience, and one I would heartily recommend to anyone interested in science and society. I was lucky enough to get the opportunity to represent the British Ecological Society at VOF. I was part of the panel putting questions to Chi Onwurah MP. She received two questions relating to the environment and one relevant to early-career researchers. First off, the Institution of Chemical Engineers asked Chi Onwurah MP about the EU Parliament-approved ban on single-use plastics and what would happen if this doesn’t become a fully-fledged directive before the UK leaves the EU; should the UK Government implement something similar? Chi Onwurah MP argued that we need proper regulatory action to reduce plastic pollution, an issue close to her heart because she already sees its effects in her constituency of Newcastle upon Tyne Central. 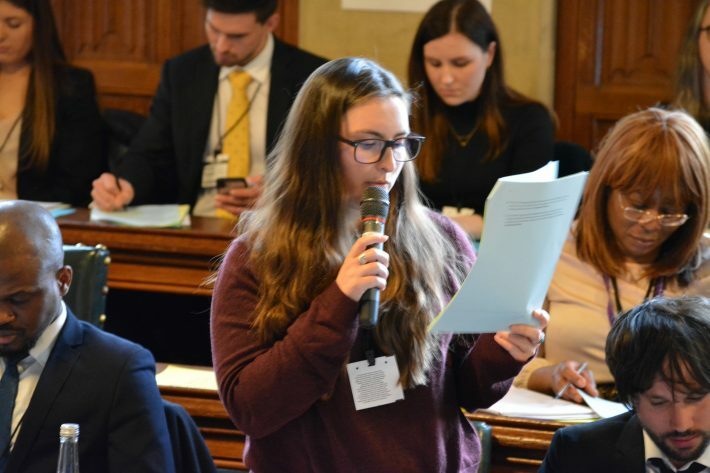 She commented that Rt Hon Michael Gove MP’s sacrifice of single-use plastics for Lent is a welcome gesture, but one that must be followed up with the necessary legislation if change is to be achieved. Finally, she pointed out that a ban on single-use plastics is a start, but it isn’t enough – we need wider structural change in order to prevent damaging environmental pollution. Chi Onwurah MP was then asked by the Society for Applied Microbiology what she thought was the biggest issue facing the environment today and how she was working with scientists to address it. Reassuringly, she replied that climate change is the largest threat posed to the environment and that the UK Parliament is working to decarbonise the economy. However, she noted that tackling this problem requires a vast amount of policy change. The final question of the session was posed by the Physiological Society, asking how academia can be made more secure as a career in terms of contract length and support. She said that Labour are considering a minimum funding time for contracts and the Government is looking at Fellowships that can span multiple contracts, which was encouraging. Chi Onwurah MP is from an engineering background herself, and I was sufficiently convinced that she was aware of and understood the lack of security that early-career researchers currently suffer from. The whole morning was an eye-opening experience, and one I would highly recommend to anyone interested in science policy or the workings of Parliament. Hearteningly, when Carol Monaghan asked the room how many of us would consider a career in politics, a good third of the room raised their hands, me included. One can only hope this group of engaged scientists follows through.